The Outsider Art Fair: a victim of its own success? Now that so-called outsider art has gone mainstream, the niche fair responsible for promoting it to the contemporary market may have become a victim of its own success. The Outsider Art Fair’s 27th edition seemed diminished from more robust presentations of years past, a stark illustration of how commercialisation can still the pulse of discovery. Top material from recognised folk or self-taught artists seems to have disappeared into private collections, after showing up in major institutions like the National Gallery of Art in Washington, DC or the Metropolitan Museum in New York, which now owns a primo group of works by Southern African American artists, thanks to a 2014 gift from the Souls Grown Deep Foundation. Outsider Art is now a hot commodity. Yet, at the fair’s 17 January opening, I saw too many works I’d seen last year, and the year before, and the year before that. Or lesser versions of works by the same artists. Too much of what was raw, primitive, psychologically complex and aesthetically appealing now looks generic, dispirited or merely childlike. Still, as at any fair, this one offered treasures of a sort, and I don’t mean the handful of celebrities, like Susan Sarandon and Jessica Lange, who attended the opening, or the occasional celebrity artist with work on view. “Some people are really upset about this,” said the contemporary dealer Michelle Maccarone. In her booth were “political portraits” by the actor Jim Carrey. Fair director Andrew Edlin initiated the idea, she said. “Jim may not be an outsider, but he is self-taught,” Maccarone noted, adding that Carrey’s drawings had “flown out the door” during his recent show in her Los Angeles gallery. Yet only one drawing here, depicting Donald Trump as a piece of toast, approached the level of even a minor political cartoonist. The label, Outsider Art, has never quite settled on a single definition—folk art, visionary art, self-taught art, art by the mentally disabled—though it has minted stars like Thornton Dial, Lonnie Holley, James Castle, Henry Darger, Judith Scott and Martin Ramirez. Examples from each, of varying quality or interest, were available at different stands at premium prices—Ricco Maresca Gallery had an excellent, small Ramirez for $185,000—but the real fun of a fair like this is to hunt and gather unique expressions by the lesser known, the new and the different. Another featured section was devoted to the late Phyllis Kind, the dealer who brought Chicago’s outliers into the contemporary art fold. Though a welcome homage, it featured little of substance. My favourites here tend to be small, localised dealerships, like Milwaukee’s Portrait Society Gallery, Clayton, Georgia’s Main Street Gallery, and New York’s nonprofit Fountain House Gallery, where dog portraits by Mercedes Kelly and woven textiles by Alyson Vega rarely disappoint. 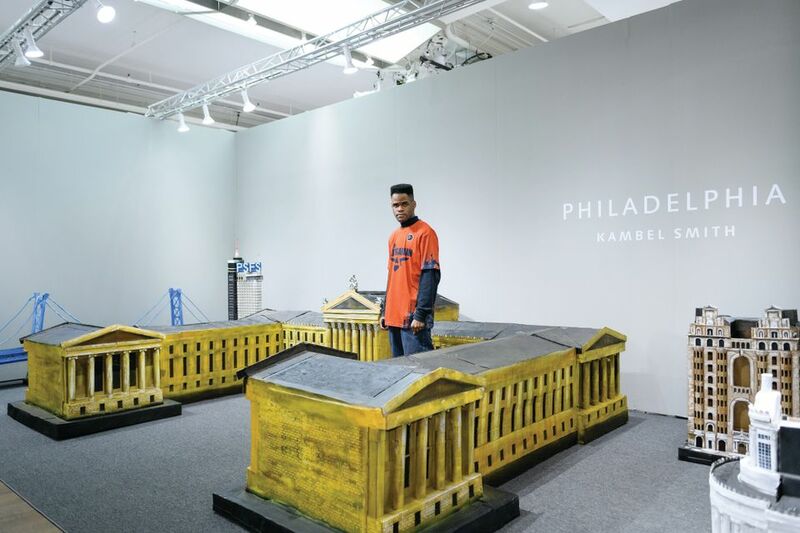 New to me, at Dallas’s Chris Byrne, was 32-year-old Kambel Smith, an autistic artist from Philadelphia whose painted cardboard, architectural constructions recreate prominent buildings in his hometown. They included a Philadelphia Museum of Art big enough to crawl through. It wasn’t like anything else at the fair, which I hope will continue to cast a wide net, while sticking close to its roots.